"This is a traditional meal in the homes of the French Canadians that will leave your home smelling of warm spices and your belly full." Preheat oven to 425 degrees F (220 degrees C). Spread flour out in a thin, even layer on a baking sheet. Roast the flour in the preheated oven until medium brown in color, 10 to 15 minutes; stir often and watch carefully to avoid burning. Remove the flour from the baking sheet immediately once the desired color has been reached; set aside in a shallow bowl to cool. Melt butter in a large, heavy pot over medium heat, and cook and stir the onion until translucent, about 5 minutes. Transfer the onion to a large mixing bowl. In a small bowl, mix the cinnamon, nutmeg, and cloves; stir the spice mix into the onion. Place ground pork, parsley, egg, and bread crumbs into the bowl, and mix to combine thoroughly. Form the meat mixture into 1-inch meatballs; roll each meatball in the roasted flour. Reserve unused flour. Pour the chicken broth into the pot, bring to a boil over medium heat, and carefully drop in the meatballs, a few at a time, stirring to keep them from sticking on the bottom. Drop in the bay leaf. 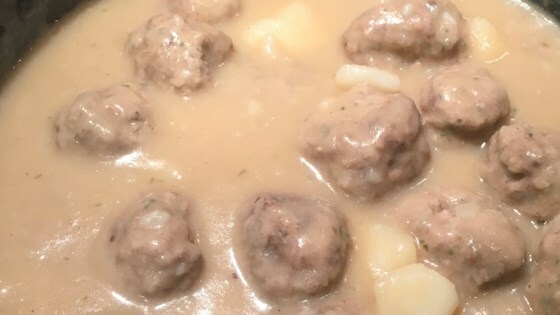 Simmer the meatballs for 20 minutes; mix in the potatoes, and simmer until potatoes are tender and the broth has reduced, an additional 20 minutes. Transfer the meatballs into a bowl with a slotted spoon. Remove and discard bay leaf. Mix remaining roasted flour with cold water in a cup, and gradually whisk the flour mixture into the simmering broth to thicken. Bring the gravy to a full boil, and cook, stirring constantly, until the gravy thickens, about 5 minutes. Return the meatballs to the stew, and serve. I followed the recipe but seemed a little short on liquid when I started cooking the meatballs and so added a little more broth. They were delicious! My mother and memere always made this recipe with just cinnamon. Good recipe though.